This lens will get you a lot closer than even a regular 1:1 macro lens, but with restrictions that regular macro lenses don’t have. With no focus mechanism, it can’t be used for regular (non-macro) subjects, and a focus rail is all but essential. That said, it offers amazing magnification at a very appealing price. A regular macro lens will give you a 1:1 reproduction ratio, which is actually the technical definition of ‘macro’ photography, and will focus close-enough for some stunning blow-ups. But that’s nothing compared to the Laowa 25mm f/2.8 2.5-5x Ultra Macro. As the name suggests, this can capture tiny subjects at anywhere from 2.5 to five times their actual size. The Laowa is also pretty inexpensive for a lens that can offer this kind of magnification. Canon makes a MP-E 65mm f/2.8 1-5x Macro, for example, that costs more than double what this Laowa model will. There are some limitations. One is that this lens has no focus mechanism. You get subjects sharp solely by controlling the camera to subject distance. This involves minute adjustments, which are tricky without a dedicated focusing rail like the Manfrotto 454 Micro-Positioning Plate, for example, which has a geared screw drive for precise positioning. 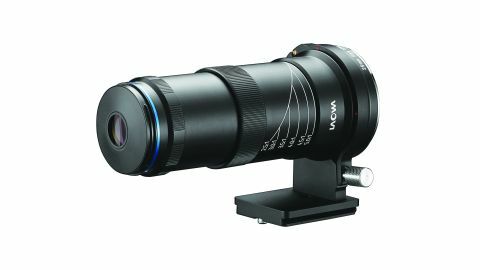 The lack of a focus mechanism also means that, unlike regular macro lenses, the Laowa can’t be used for ordinary long-distance photography, which is why it’s not possible to carry out our regular lab tests. This lens only does macro photography, nothing else. It’s also manual focus only. That’s less of an issue with macro photography, where focusing is usually done manually anyway, but with no mechanical or electrical connections between the lens and the camera body, exposure is fully manual too. The Laowa delivers crisp, sharp results at 2.5x magnification, but a fraction less clarity at 5x. The results are still good, but don't have quite the same contrast or knife-edge sharpness. With macro, however, it’s not always easy to separate the lens performance from the effects of the conditions you’re shooting in. At 5x magnification, tiny objects become huge, but depth of field is extremely shallow, regardless of the lens aperture. What looks like a sprouting avocado is actually one of the tiny seeds on the outside of a strawberry.